This Big Mac copycat recipe is a great recipe to follow, to create a quick, easy and tasty mid week snack. We recommend following our recipe for the Big Mac special sauce for maximum likeness, however you can always use thousand island dressing, if you're in a rush or not in the mood to make the sauce. 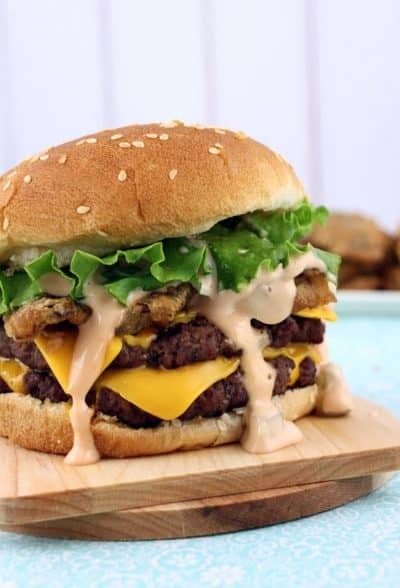 Either use Thousand Island dressing for the sauce or create our Big Mac Sauce copycat recipe following this method and let it chill. Separate the ground beef into two thin 15cm patties and season with a sprinkle of salt and pepper. Cook both patties in a hot pan for 2 minutes on each side over a medium heat until slightly charred. Lightly toast the three bun halves, either in a hot pan with butter or in a toaster. Create your final Big Mac by stacking the elements in the following order. For our Big Mac Sauce recipe click here.